Record: Start recording screen in either Full screen or a Custom Region. Stop Recording: When you finish recording, select this menu item to stop your recording. Pause Recording: Pause the recording and resume it when required. Folder Shortcut: Select a folder to save your screen recordings. Perform folder related operations like: rename, remove, open location. Search: Select the folder in which you want to search your screen recordings. Hide Mode: My Screen Recorder Pro will run in the background without displaying an icon on the screen or on the taskbar. 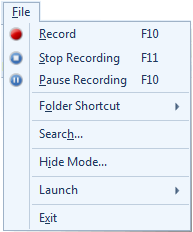 Cut: Move your recording(s) to a different recording folder. 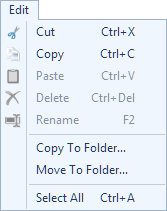 Copy: Create copies of your recording(s) in a different folder. Paste: Paste copied file in the selected folder shortcut. Delete: Permanently delete the selected file from the recording folder. Rename: Select a recording and press F2 to update the recording file name. Copy To Folder: Copy the selected files to the desired folder location. Move To Folder: Move files to the selected folder location. Play Menu: Player controls to view the screen recordings. Play: Click the Play button to start watching your screen recording. Pause: Play will toggle with pause button. It will stops the play slider at the current point. Stop: Stop button stops video playback. Previous and Next File: Choose to play the next recording or the previous one in the File List. Rewind and Forward: Clicking the Rewind and Fast Forward button sends the play slider backward and forward as configured in Seek Settings. 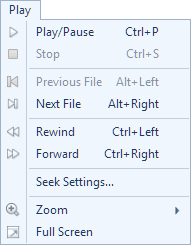 Seek Settings: Set the amount of time or frames for a single click of the rewind/forward buttons. Zoom: View the screen recording at different magnifications by using Zoom-in and Zoom-out. Full Screen: Clicking on Full Screen will hide the toolbar and menu bar. Only the Recording preview area will be visible. View Menu: Change the view and sort your recordings. Large Icons: Display icons for each recording file. List: Display the recordings in a list. Details: Display the size, duration, dimensions, and more for each recording. Thumbnail: Shows the first frame of your recording in a small image. 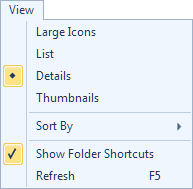 Show Folder Shortcuts: Toggle the Folder Shortcuts panel to hide or unhide to increase display area. Refresh: Press F5 to refresh the list of recordings. Mouse Pointer Image: Select a different mouse pointer. Movement Effects: Highlight mouse movements and clicks. Time and Text Annotation: Add date and time stamp and text captions to your screen recordings. Image Overlay: Add Watermarks or logos to your screen recordings. Screen Draw: Use your mouse to mark and emphasize any text or diagram on your PC screen. Audio Recorder: Record audio using speakers or microphones, without any screen capture. Trim File: The screen cutting tool helps you remove unwanted segments from the recording. Join Files: Combine multiple videos into a single file. Convert: Convert your screen recordings to WMV, AVI, WebM, or H.264 (MP4) format. Make Video executables: Make your screen recordings playable on a PC, without a media player. Upload: Upload recordings to your FTP account. Schedule Recording: Schedule screen recording to automatically start and stop at a specific time. 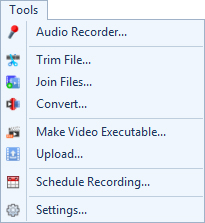 Toolbar provides a quick access to all the important features provided in My Screen Recorder Pro. Click on the Record icon to start recording Full screen or Custom Region. The Record button toggles with pause. Click to stop the screen recording. Trim your screen recordings to remove unwanted segments from your screen recordings. Join your screen recordings to view them as a single file in continuous manner. Convert your screen recordings to WMV, AVI, WebM or H.264 (MP4) format. Select multiple screen recordings and create a single.exe to play these files. Upload your screen recordings to your FTP account. Create a schedule that will automatically start and stop the recording.